"Anyone who went on Distant Worlds 3302 knows this well. Crossing it is one of the most arduous journeys many of us have ever taken - that humanity has ever taken. When we did it the first time, everything was all new, we were young and inexperienced, but we found our way, and made it to the otherside without getting lost. We found something new on our journey, a new way to look at the galaxy, a new way to cross it, to travel as a team, to take working together to a whole new level. To continue in this Distant Worlds tradition, we need to find something new this time too. It’s a huge galaxy, after all." 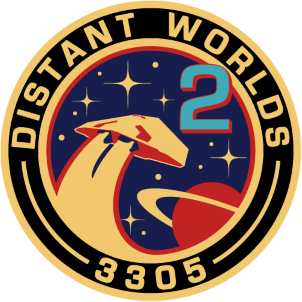 Distant Worlds 2 is an expedition journey to the far outer rim and back, with the outbound journey culminating at Beagle Point around 20 weeks after departure. Its mission statement is to take thousands of CMDRs on a journey of discovery, to see what mysteries the galaxy contains, finally unlocked for all with the new scanners and Codex to guide us. We also plan to organize the return trip, and this will be a more indirect route home, taking participants through some seldom-traveled regions in an attempt to survey large areas of the 4th Galactic Quadrant (the 'Eastern' regions of the ED galactic map) for the in-game Codex and Galactic Mapping Project. The overall journey (there and back) will cover at least 200,000 light years. The exact overall timeframe for the return journey has yet to be be determined. For those new to mass expedition events, the basic premise is that fleet members will travel the route at their own pace, either alone, with friends, or in wings, and will regroup at designated waypoints along the journey. These waypoint gatherings will begin on a Friday (times to be announced) and end on a Sunday (times to be announced). Waypoints for the outbound journey will be on average 4,500 LYs apart so players signing up to DW2 need to be aware of this if they have limited gametime per week to commit. Over a 'Waypoint Weekend' there will be all sorts of events and projects to take part in. Participation in events and projects is 100% voluntary. What is new to all players in this mass expedition is the focus on Discovery - the journey to each waypoint will be its own mini expedition, with the goal being for people to see if they can uncover any of the anomalies and mysteries of the galaxy, and submit them for the sake of the whole expedition. We will then organise meetups to view and study the findings along the way! The expedition will launch from the Distant Worlds 3302 Tourist Beacon in Pallaeni (Waypoint 1) in mid-January 3305 (exact date to be announced). Distant Worlds 2 will be the first major expedition to utilize Squadrons. Dr. Kaii will lead the FleetComm Squadron. This is the official Squadron for the expedition; however, joining it is not mandatory. Players who are part of their own Squadrons will not be excluded from any aspect of DW2. More information on Squadron gameplay and potential squad-based events will be posted here in due course. The Consoles Team aim to ensure suitable console representation for the duration of DW2. The original Distant Worlds Expedition departed too early for many XBOX commanders and PS4 involvement was only a pipe-dream, so this is the first opportunity for the majority of these commanders to take part in a truly Galactic Exploration Event. We shall guide console commanders to the appropriate roles, and deal with console-specific issues as they arise. We shall lend support to each role's leaders as requested, whilst facilitating console involvement within those roles. We shall be the representatives of the organisers, and be expected to perform a myriad of support duties specific to console involvement. Console player groups and squadrons will be announced here shortly; please bookmark this thread. There is also an option of submitting an email address, if you prefer to receive notifications by email. It will not be used for anything except sending a weekly email with the newsletter and summary of the week, with notifications about impromptu meetups at any awesome discoveries that have been made. The expedition will encompass a myriad of gameplay activities, with many of these coming from a variety of role-based projects. Choosing one role over another does not prevent you from taking part in any event or project during DW2 as many of the projects will overlap in certain aspects, and are written in a way that facilitates cooperation. Distant Worlds 2 will pioneer the new mechanics of discovery via the new scanner mechanics and the codex. The theme of the expedition, and goal of the role of the Exploration role, is to discover as much as we can while journeying to Beagle Point, and this will require exploring the space in between. Reported - When a Commander finds the rumoured item in question and scans it, it then shows up as ‘reported’ in the Codex, and update everyone’s Codex along with their name. If you then find it, and scan it, that will then become ‘Discovered’ in your Codex. Starting out from each basecamp launch event, A Journey of Discovery will be led by the Exploration Team as the fleet traverses the route to the next waypoint gathering. Connect the findings and discoveries to all other roles and departments in the fleet. "Sagittarius A* at the heart of the Milky Way is the only supermassive black hole the human race has access to. Situated approximately 23,000 light years away, these days it is well within commute range of the scientific community. Close up scientific study of the supermassive black hole is an opportunity that humanity is about to embrace. The deployment of a science station in a system close to Sagittarius-A* will be an endeavor that the Distant Worlds fleet is proud to be at the forefront of. A new Age of Discovery out in the depths is about to begin, and this is your chance to be a part of this historical chapter of human endeavor and tenacity at pushing back the boundaries. The station will further science and act as a relay station for the discoveries dawning with the Age of Discovery." The industrial aspect to Distant Worlds 2 will call upon the galactic community to help gather the materials to be used in the construction of the science station in the galactic core region. The exact details of this initiative will be released as the expedition launch date approaches. Upon completion of the station, the DW2 fleet will depart the galactic core waypoint and continue its journey along the expeditionary route. The Mining Department expects to spearhead Deep Space Mining through the procurement of metals and minerals, attainable only through the mining and refining of asteroids, throughout DW2. Utilise resources for obtaining accurate Pristine locations and Resource Extraction Sites etc. Finally, the Mining Dept. in addition to their prospecting arsenal, will be using this opportunity to figurehead the new mining technology by incorporating the latest releases in mining ingenuity to their vessel. The Mining Operations will lead the way for all to see in flying the flag for Deep Space Mining during the Distant Worlds 2 Expedition. Dedicated to understanding and expanding public knowledge, the scientists are primarily data gatherers and analysts. They are also at the forefront of exploration, always keeping tabs on the new discoveries and odd sightings from fellow commanders, and helping them by performing research as needed, or putting their skills at disposal of other departments. Data will be presented in a series of Scientific Papers that will be published in the DW2 Newsletter, with a final .pdf booklet created and made available for download at journey’s end containing a wealth of stats and data on what the DW2 fleet discovered. This project will be headed up by EfilOne. Joining the Trans-Galactic Metallicity Survey provides an opportunity for participants to perform real science during the expedition, advancing our understanding of how the Stellar Forge works and how the map of the galaxy it produces matches or differs from real world observation. The method of data collection has been tweaked to eliminate needless procedure and minimize the amount of manual record keeping required. This project will be headed up by Satsuma. The Geology department is devoted to the study of all unique features that can be found on the surface of airless worlds. Working hand-in-hand with the Explorers, we seek out volcanic activity, organic life forms, unusual terrain formations, and other mysterious things for further investigation. By signing up as a Geologist, you will be helping to locate and survey sites of interest on planet surfaces (Horizons required). Duties include gathering scan data, images, and notes about geological features and organic life forms, for input into a catalog of DW2 discoveries. Working with the Resource Acquisition Team and Scientists, our data will be analyzed for the purposes of material gathering and enhancing the scientific understanding of our galaxy. Scenic views will be featured in DW2 publications, and events and games will be planned at some of the most unique locations found. This project will be headed up by MadRaptor. This will be in association with Sapyx’s project to locate and catalogue Gas Giants that display glowing or fluorescent atmospheres. These worlds are particularly rare and will offer exploration wings within the fleet an opportunity to set up field trips to seek out these mysterious worlds for the GGG Project. On Distant Worlds 2 we’re yet again pushing the boundaries of human expansion, and diving even further into unexplored space – but this time everyone can be a part of this push. To make this historic event as attainable as possible to as many people as possible, we at the Galactic Travel Agency have committed to opening our ships to all who wishes to come aboard. Our goal is simple and precise; to democratize exploration! Sign up to become a Galactic Travel Agent, providing a service to the CMDRs in the Bubble for whom the act of spending months out in the black, away from responsibilities, family, friends and civilization is simply too big a sacrifice to make. This project will be headed up by Kolato. This will be held in conjunction with the Galactic Mapping Project. The Boreas Expanse is a region beyond the Perseus Stem; vast, but of which little is known in terms of community-submitted points of interest. The GMP would like to add more POIs to the community maps for this region, and as such the DW2 fleet will pass through its heart en-route to the Abyss. This is an opportunity for explorers to seek out interesting places and submit them to the mapping project as candidate POI locations. This project will be headed up by The Galactic Mapping Team. Scheduled for the journey home - Details to follow. An imgur album and dedicated thread will be set up for participants to submit their screenshots to. During the expedition, the best of these screenshot submissions will be highlighted in the weekly DW2 newsletter, with the astrophotographers that took them winning a prize. This project will be administered by Qohen Leth. Fleet Logistics is a semi-roleplayed / semi-practical project. There are two aspects to this idea. Supply and Trade. Supply will carry food equivalent to the amount required to support a fleet of this size as it journeys into the black. Traders will carry various rare commodities for use in celebrations, or to trade with non-human settlements we may encounter. This project will be organized by Olivia Vespera and the Fleet Logistics Team. Introducing an all new role for DW2: Discovery - the Fleet Mechanic Arm will be on hand to repair ships after mishaps. The original expedition in 3302 saw pilots taking damage from collisions, asteroid impacts, landing damage and an abundance of enthusiasm with high-gravity planets. And now the risks are even greater with explosive mining, a larger fleet, and more. Before, pilots with hull and canopy damage were doomed to spend the rest of the expedition flying cautiously; this time around, the Fleet Mechanic Arm will be there as the pilots to hold the fleet together. Find us amongst the fleet, at basecamps, or if things are desperate, via our emergency channel. Organised Fleet Mechanic assignments will be coordinated by Alex Brentnall. DW2 ED:RPG is a role playing game based in the Elite Dangerous universe. Join us as the players work on the Puzzle of the Crystalline Keys and make a shocking discovery during the expeditions journey across the galaxy. (Emma Storm story arc - Outbound). This project will be headed up by Wishblend. The original Distant Worlds Expedition was the birthplace of the Rock Rats, creating the jumponium highway at a time when ships could not easily cross The Abyss. We are proud to have them joining us once again, acting as the glue, in fact the silver thread running through the whole expedition. Their role has evolved since DW1 and now they stand for a social, dynamic, helpful and coordinating group of veteran explorers. In their own words: “Our role in Distant Worlds 2 is to assist foremost the departments of exploration, mining, geology and science. But also in general to bring the expedition’s expertise together, see opportunities and connect. We fly or drive by your side and hopefully inspiring things will come of it”. It is an esteemed honour to have them joining us, and the majority of what’s going to be awesome about the expedition will be thanks to them! The expedition is going to be composed of several thousand commanders, and therefore several thousand playstyles. Our goal as organisers is to accommodate as many playstyles as possible. The general ethos will be one of freedom and diversity. You will be able to take part to whatever extent you like, and we hope there will be plenty of activities and goals on offer for you to take your pick. There will be events, meetups, competitions, missions, games, and much more, all within the framework of the journey, and with the overarching theme of discovery. In order to keep the fleet as a fleet, and the expedition as an expedition, efforts will be made to keep things structured. Waypoints will be revealed only when it is time to head toward them, and CMDRs who rush on ahead will be removing themselves from the fleet, and therefore this is discouraged. There will be plenty to do and see between waypoints we hope! On DW2, each waypoint to waypoint stage of the journey will in effect be an expedition within the whole. Even though the average distance between waypoints will be around 4,500 LYs, the new content update and discovery mechanics will encourage us to rethink the way in which we explore. There is so much more to do, so much more to discover, and so much more to think about during any WP to WP journey. Therefore we want players to think about their actual weekly journey during each stage, and not so much the weekly destinations. DW2 will be one of the first major expeditions that incorporates the new exploration mechanics, utilizes the Codex, and experiments with new techniques in discovering any new content that's out there. We estimate a requirement of around just 90 minutes travel time spread over 5 days for a 45 LY ranged ship (the current fleet average) between waypoints. So we hope that revealing the route in stages will also help encourage the early emphasis of the DW2 expedition to lean toward a more thorough and slower-paced attitude to exploration and discovery during our journey into the new unknown! If you have trouble locating surface coordinates there are a couple of ways to locate them easily. The first method is ask in local chat for a wing beacon from someone who is already landed at a basecamp. Alternatively use E.D.I.S.O.N. This a fantastic 3rd party program that allows commanders to easily locate surface coordinates. It is very easy to use, simply copy the basecamp coordinates and planetary radius from the table above, and paste them into the relevant boxes on the E.D.I.S.O.N. UI. Approach the planet and click on the 'Start Navigation' button. Follow his flight instructions and he will guide you to where the basecamp coords are. I'm unsure as to whether this works in VR or not. E.D.I.S.O.N. was created by CMDR Maxine Slayton. Will be posted here shortly before the expedition launch day.